I just got a wonderful update from the Washington Humane Society. Blue has been adopted! She is now called Emma and she's settling right in and learning tricks like crazy. And she's already all dressed up for Halloween! AWESOMENESS!! Way to go Blu! So glad we found you too and that Emma has a new home! Great blog! Meu Deus! 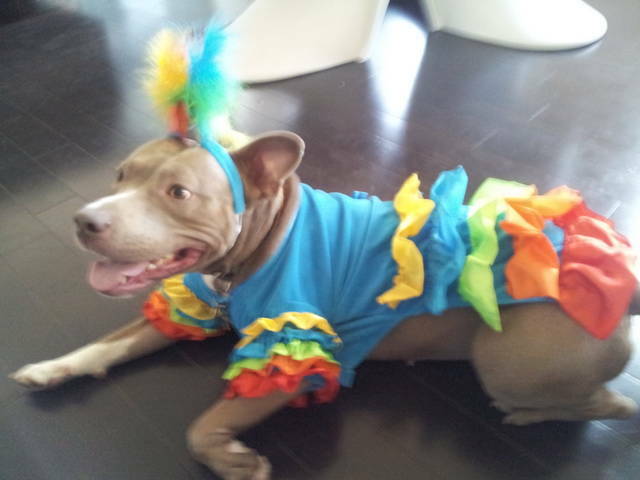 I think someone is ready to samba! Wow, that didn't take too long. Thanks for sharing the news. I hope Emma does great with her new family. Yay! How wonderful that Blue now known as Emma has her new forever home and just in time for Halloween too! LOL! YESH, Blue - thanks for sharing the news; she sure is in the spirit of Halloween. Yay! Such good news! Are you keeping in contact with the people who adopted her? !